De Tomaso Modena SpA was an Italian car-manufacturing company. It was founded by the Argentine-born Alejandro de Tomaso (1928–2003) in Modena in 1959. It originally produced various prototypes and racing cars, including a Formula One car for Frank Williams' team in 1970. The company went on to develop and produce both sports cars and luxury vehicles. From 1976 to 1993 De Tomaso owned legendary Italian sports car maker Maserati, and was responsible for producing cars including the Biturbo, the Kyalami, Quattroporte III, Karif, and the Chrysler TC. De Tomaso also owned motorcycle company Moto Guzzi from 1973 to 1993. On May 21, 2003 Alejandro de Tomaso passed away and the De Tomaso went into liquidation in 2004, although production of new cars continued after this date. By 2008 a buyer was being sought for the De Tomaso factory and trademarks, as per the court-appointed liquidators. In 2009 Gian Mario Rossignolo bought the De Tomaso trademark and founded a new company named De Tomaso Automobili SpA. Rossignolo planned to assemble chassis and bodies in one of Delphi Automotive’s old production facilities in Livorno and to fit bodywork, paint and finish its cars in the former Pininfarina factory in Grugliasco. In 2014 the original workshop in Modena was in abandonment. In May 2012, De Tomaso was again for sale after their business plan failed to gather sufficient financial backing. In July 2012, Gian Mario Rossignolo was arrested following allegations that he misused €7.5 million worth of government funds. In September 2012, speculation emerged that BMW might be interested in the brand factory to produce new BMW models. In April 2015 an Italian bankruptcy court approved the sale of the company to China's Consolidated Ideal TeamVenture, for a mere 1.05 million euros, or approximately $1.17 million USD. Per that sale report "A lawyer for the buyer announced that Ideal TeamVenture plans to produce cars in China bearing the De Tomaso name." 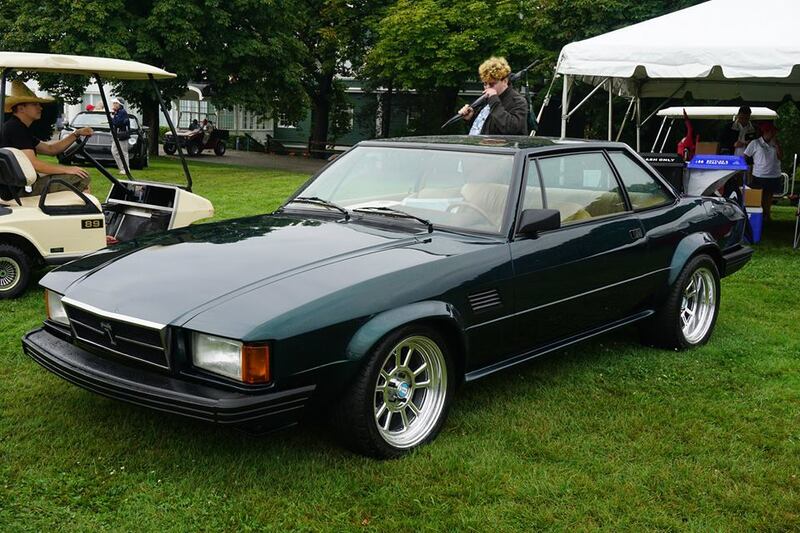 The Longchamp was developed from the De Tomaso Deauville four-door sedan, using a shorter wheelbase chassis with the same suspension, engine and transmission. The two models were the only front-engined production cars produced by De Tomaso. The Longchamp was first exhibited at the 1972 Turin Motor Show and was initially offered only as a two-door 2+2 coupé. It was built from 1972 through 1989 and designed by Tom Tjaarda of Ghia and was influenced by his previous Lancia Marica prototype. The taillights were the same units as were used for the Alfa Romeo 1750/2000 saloon. The headlights and front indicators are from Ford of Europe Models Ford Consul / Granada. The Longchamp featured a long and wide hood to accommodate the American power train, i.e. the 351 cubic inch (5,769 cc) FordCleveland V8. The 351 Cleveland, a popular and very potent engine in late 1960s Ford "muscle cars," was the same unit as that used in the Pantera. It produced a minimum of 330 hp (246 kW) and gave the Longchamp an official 240 km/h (149 mph) top speed. The standard gearbox was a three-speed Ford C-6 Cruise-o-Matic automatic gearbox, however around 17 cars were equipped with a five-speed ZF manual gearbox. The suspension was independent front and rear with coil spring and wishbone suspension. Steering was power assisted rack and pinion with vented disc brakes all around, the rear discs being positioned inboard. The interior of the car was quite luxurious and it was almost fully covered with leather, although the use of Ford's partsbin (steering wheel, gear shift) took away somewhat of the luxurious impression. Small successes with the Vallelunga, and the talents of the Ghia designer studio, encouraged DeTomaso to firmly establish himself amongst the big league of supercar builders in Modena. Ghia had produced the as yet unnamed Mangusta body style for Iso, but they rejected it, not wanting a mid-engine configuration. At the same time, DeTomaso had designed and built a sports racing chassis for Carol Shelby; the development of which was entrusted to Peter Brock. As Shelby became more and more involved with the Cobra programme, and subsequently the Mustang programme for Ford, the sports racing chassis was dropped. The enterprising DeTomaso saw his opportunity to marry the 2 designs and placed the Mangusta shell onto the sports racing chassis. The name ‘Mangusta’ is a gesture, polite or otherwise towards Shelby, as the Mangusta (Italian for Mongoose) is the only animal that will take on a Cobra snake and win. Undoubtedly, the beautiful shape of the Mangusta, first shown at the Turin Show in 1966, firmly established DeTomaso and Ghia on the world stage as designers and producers of a breath-taking car. "The Pantera is an American hot rod in an Armani suit"
The Pantera was a sports car produced by the De Tomaso car company of Italy from 1971 to 1991, the last one being delivered to a customer in 1992. The word "Pantera" is Italian for "Panther". The car was designed by US-born designer Tom Tjaarda and replaced the De Tomaso Mangusta. Unlike the Mangusta, which employed a steel backbone chassis, the Pantera was a steel monocoque design, the first instance of De Tomaso using this construction technique. It made its public debut in Modena in March 1970 and was presented at the 1970 New York Motor Show a few weeks later. 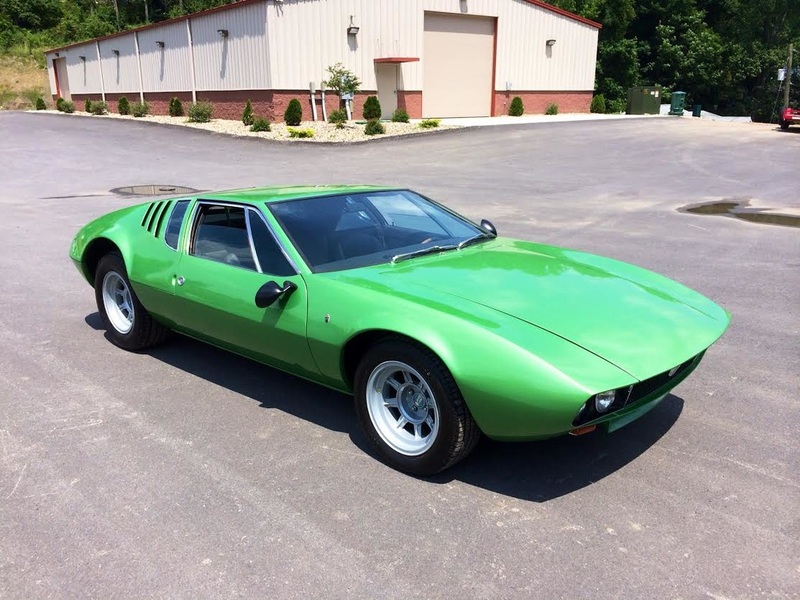 Approximately a year after that production Panteras started finding their way into the hands of customers and production had already been ramped up to a remarkable (by the standards of Modena-built exotica) 3 per day. Reflecting its makers' transatlantic ambitions, the Pantera came with an abundance of standard features which appeared exotic in Europe, such as electric windows, air conditioning and even "doors that buzz when ... open". By the time the Pantera reached production, the interior was in most respects well sorted, although resting an arm on the central console could lead to inadvertently activating the poorly located cigarette lighter. The first 1971 Panteras were powered by a Ford 351 in3 (5.8 L) V8 which produced 330 hp (246 kW). The high torque provided by the Ford engine reduced the need for excessive gear changing at low speeds: this made the car much less demanding to drive in urban conditions than many of the locally built competitor products. The ZF transaxle used in the Mangusta was also used for the Pantera: a passenger in an early Pantera recorded that the mechanical noises emanating from the transaxle were more intrusive than the well restrained engine noise. Another Italian exotic that shares the ZF transaxle is the Maserati Bora, also launched in 1971 though not yet available for sale. Power-assisted four-wheel disc brakes and rack and pinion steering were all standard equipment on the Pantera. The 1971 Pantera could accelerate to 60 mph (97 km/h) in 5.5 seconds according to Car and Driver. In the summer of 1971 a visitor to the De Tomaso plant at Modena identified two different types of Pantera awaiting shipment, being respectively the European and American versions. From outside, the principal differences were the larger tail lamps on the cars destined for America along with "fender side-lamps". Not being a cost-accountant but a journalist, the visitor was impressed by the large number of cars awaiting shipment: in reality spending the best part of a year under dust covers in a series of large hangars probably did nothing for the cash-flow of the business or the condition of some of the cars by the time they crossed the Atlantic. Late in 1971, Ford began importing Panteras for the American market to be sold through its Lincoln Mercury dealers. The first 75 cars were simply European imports and are known for their "push-button" door handles and hand-built Carrozzeria Vignale bodies. A total of 1,007 Panteras reached the United States that first year. Unfortunately, these cars were poorly built, and several Panteras broke down during testing on Ford's own test track. Early crash testing at UCLA showed that safety cage engineering was not very well understood in the 1970s. ​Rust-proofing was minimal on these early cars, and the quality of fit and finish was poor, with large amounts of lead being used to cover body panel flaws. Notably, Elvis Presley once fired a gun at his Pantera after it wouldn't start. Several modifications were made for the 1972 model year Panteras. A new 4 Bolt Main Cleveland Engine, also 351 in3, was used with lower compression (from 11:1 to 8.6:1, chiefly to meet US emissions standards and run on lower octane standard fuel) but with more aggressive camshaft timing (in an effort to reclaim some of the power lost through the reduction in compression). Many other engine changes were made, including the use of a factory exhaust header. The "Lusso" (luxury) Pantera L was also introduced in 1972. It featured large black bumpers for the US market as well as a 248 hp (185 kW) Cleveland engine. The 1974 Pantera GTS featured yet more luxury items and badging. Ford ended their importation to the U.S. in 1975, having sold roughly 5,500 cars in the United States. De Tomaso continued to build the car, however, in ever-escalating forms of performance and luxury for more than a decade. A small number of Panteras were imported to the US by gray market importers in the 1980s, notably Panteramerica and AmeriSport. In all, about 7,200 Panteras were built. The De Tomaso Deauville was a large four-door sedan first exhibited at Turin Motor Show 1970. It was produce from 1971 through 1985. The car was powered by the same 351 in³ (5763 cc) Ford Cleveland V8 as the De Tomaso Pantera, rated at 300 hp. The car had a top speed of 230 km/h (143 mph) and featured styling similar to that of the Jaguar XJ. The Deauville had an independent rear suspension very similar to that used by Jaguar, and ventilated discs in all four wheels. It shares its chassis with the Maserati Quattroporte III. A total of 244 Deauvilles were produced. There were three Deauville variants: the early series 1 (1970–1974: serial number 10##, 11## and 12##), late series 1 (1975–1977: serial numbers 14##) and the series 2 (1978–1985: serial numbers 20## and 21##). One Deauville station wagon was made for Mr. De Tomaso's wife. There were also two armoured Deauvilles produced, one for the Belgian Royal Family and the other for the Italian government. The latter is on display in the Museo delle Auto della Polizia di Stato in Rome. 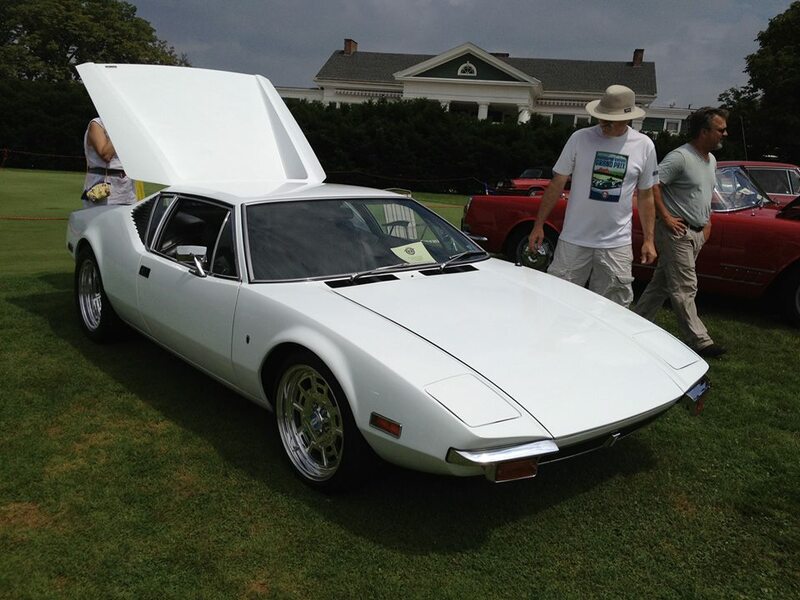 This was DeTomaso’s first foray into the production of a sports car with a view to low volume production. Initially, the car was intended to be built in aluminium, and the first few Fissore bodied cars, generally known as the prototypes were. However, production was transferred to Ghia Carrozzeria, now owned by DeTomaso, and the bodies were built in fibreglass. Production was slow, and it is generally thought that 45/50 cars were built. Powered by a Ford , 4cylinder 1500 cc engine, the power to weight ratio was such that the car proved itself to be very competitive on the track, and scored many notable successes. Follow The Cortile's board Cortile della De Tomaso Pantera on Pinterest.